Marijuana - whether medical or not - is inching its way toward broader legalization across North America, and perhaps around the world. This could lead people who are interested in imbibing but not keen on inhaling carcinogens to look at vapourizer technology, much in the way some tobacco smokers are moving toward e-cigarettes as a way to ingest their favourite herbs cleanly and with less telltale odour than they get when smoking the evil weed (whichever evil weed it might be). Late last year I did a column outlining in its most basic terms the issue of marijuana use, and in the process I introduced a few of the popular vapourizers available on the marketplace today. In that column I assembled a group of baby boomers I know, folks who've been "imbibing" the still-illegal substance for decades and who are (surprisingly to some folks, I'm sure) productive members of society who just happen to enjoy the odd toke. They provided me with valuable insight and opinions, most of which were very positive of the vaping experience. On the heels of that column I was sent samples of a couple of other - and very different from each other - vapourizers, so over the past few weeks I reassembled my panel to get their impressions (and no, Rich Little wasn't one of them) of these new units, one of which had the potential to be the slickest little portable they'd seen. The other vapourizer isn't portable at all, but my panellists discovered it has its own joyful positives that made it a real, well, hit. Let's get the more negative review out of the way first. Grenco Science is the maker of the "Original Micro-G" vapourizer that we wanted to try for the last column, but couldn't because it's designed for use with "concentrates" that my panel eschewed in favour of the "ground herb" alternative. So Grenco indulged them by sending the G-Pen Elite this time, a wonderfully small unit that had my panellists' eyes starting to get red just looking at it. Indeed, the G Pen Elite ($150 U.S.) is the slickest little vapourizer any of them had ever seen, even more so than the Summit+ that took their fancy in my previous column. It's tiny, looks very cool and classy, and features a nifty little display on its side by which you can monitor its functions and temperature. And it is very cool. Once you've given the thing its initial charge (which is accomplished easily via USB), you remove its little mouthpiece to reveal the "non-combustion" chamber that hides beneath it. From there, you load it with your preferred poison, replace the mouthpiece and fire it up via a button on top. The G Pen Elite features customizable temperatures, and that extremely cool LED interface screen reads out the current temperature of the device as well as a graphic representation of how much battery life remains before you need to recharge it. Operation should be straightforward: to turn it on you press the power button five times (and five times more to shut it off). Buttons on the side let you control the temperature (the panel liked an apparently quite warm 230 degrees Celsius). Once you've chosen your preferred temperature, you hold the power button down for a second and then let it go; this spurs the G Pen Elite into action, heating the inventory you've placed inside it. Once that slick little display on the side shows that the G-Pen has reached the temperature you've set, it's time to vape. The heating process only takes a moment - the company's website claims 30 seconds - and the unit shuts off automatically after five minutes to help maintain battery life. In use, the panellists noted that the mouthpiece, which is very close to the ceramic heating chamber, got quite warm on their lips. Oh, it wasn't enough that lips burned or beards lit on fire, but it was noticeable, though hardly a deal breaker. And the vapour was tasty and substantial, making the heat worthwhile. Alas, while the operation and loading process are straightforward in theory, the testers found that working the mouthpiece off the main unit was a tad difficult. They liked the fact that the mouthpiece stays attached to the unit well, which beat the heck out of it being loose and/or falling off all the time - but it was so tight that sometimes they'd merely pull off the rubber cap, leaving the mouthpiece still attached to the unit. They could get around this by using the little tool/keychain that comes with the unit to pry it off (it also has a little credit card-like grinder in the box). This method worked fine, though it made some of the panellists wonder if/how much the mouthpiece would loosen over time (they hoped it would loosen a bit, obviously, but not so much to make it sloppy or to ruin the seal). A worse issue was that sometimes the unit would fire up while they were wrestling with removing the mouthpiece, the user's hand activing the on/off button on top while he/she/it worried the mouthpiece out of its mount - and that meant the unit could heat up while it was open (kind of counterproductive, let alone potentially painful for the user. This might not be a widespread concern, though, because the sample's power button seemed to have a life, or at least an ego, of its own. You're supposed to press the button five times to turn the unit on or off, but quite often it didn't work out that way. Instead, sometimes it would fire up before the button was pressed five times and at other times it wouldn't fire up even if you pressed it 10, 15, 20 or whatever times. It seemed arbitrary and intermittent and on more than one occasion the panellists simply gave up hoping the thing would deign to work and moved on to the next vapourizer to test. This is why there are warranties, of course (this vape's is for one year), and judging from the online reviews I've read this issue doesn't seem to be widespread. The manufacturer recommends cleaning the chamber after each use, and that makes sense, especially since there tends to get some residue and discolouration in the heating chamber if you don't. And you have to ensure the little metal screen inside the mouthpiece is clean and free of residue as well because otherwise it clogs up and prevents vapour from passing through. Making this more difficult than it should be is the fact that the screen is mounted right into the mouthpiece and no one in our tests wanted to try removing it lest they break the vapourizer. 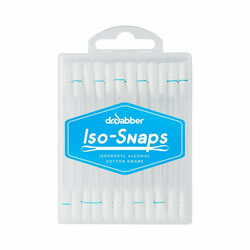 An isopropanol bath might help here; Dr. Dabber's "IsoSnaps" certainly helped (more about them later). The bottom line for the panellists is that if this particular sample of the G Pen Elite had worked properly it would probably have been their favourite of the portable vapourizer they tested to date. It's a beautiful unit, with the best and coolest display screen they'd seen on a vapourizer, and (when it works as it should) its performance is top notch. But since it simply refused to work sometimes, and at other times seemed to be on a hair trigger, the G Pen Elite often found itself on the shelf while the panellists got their hits elsewhere. And that's too bad. For more G Pen Elite reviews, check here, here, here and here. 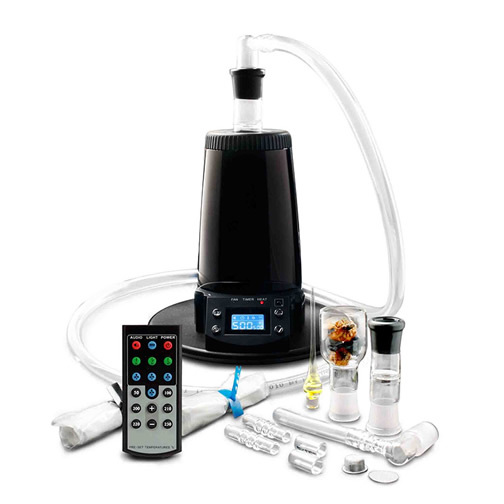 On the other hand, Arizer's Extreme Q vapourizer turned out to be an unexpected pleasure and perhaps the ultimate party treat. You won't want to carry this one around in your pocket, but on a coffee table it reminded the panellists of the "old hookah days" in which, they told me, they'd sit in a circle around the table and pass the hookah's hose around between them. The Extreme Q ($219 CAD) looks kind of like a little Doctor Who Dalek with a long plastic hose coming out of its top like a Triffid's stinger. Herbs fit into a glass chamber that perches on the unit's heating element, after which you place on top of it the glass elbow unit with the plastic hose. Besides the hose, you can also hook a plastic bag into the unit (two of which are included in the package), to fill it with vapour for what I assume are truly humongous hits. The panellists didn't care for that method, but it's there if you want it. Instead of a charging port or batteries you get an AC adapter, and there's apparently a car cigarette lighter adapter available optionally. 12 volt adapter notwithstanding, the Q isn't really practical as a portable unit unless you're going to carry it in a backpack or something. It could sure make you the life of the party if you do bring it with you, though! The Extreme Q works best via its included remote control (because the buttons and their labels on the base unit are small and hard for middle aged eyes to read). It took what seemed like forever to start emitting vapour - we didn't actually time it but it was more than five minutes from firing it up until vaping was possible. This caused panellists to get bored and move on the first couple of times they tried it but, as it turned out, bailing early on the Extreme Q was a big mistake: once the heat was raised enough (over 200 degrees Celsius proved to be a good setting) and they cooled their impatience, the Q proved to be well worth the wait. Indeed, once the vapourizer started putting out the vapour, it performed like a thoroughbred! The vapour came thick and tasty, and so potent that panellists reported it very nearly took the tops off of their heads. They also noted that this was a kudo, not a complaint. It was the best performance of any vapourizer they tried (though it was also the only "tabletop" unit they'd tried), and that made it very popular among those who enjoyed becoming babbling wrecks. Loading the Extreme Q is easy, though as with the G Pen you'll want to ensure you keep it clean because it tends to get a tad clogged after a couple of uses. It's easy to clean, though. The glass can be soaked in isopropanol and then rinsed, and the whip hose can either be soaked in hot water (you shouldn't use isoprop with it, according to the instructions, lest it taste awful afterward) or run through your dishwasher. Be careful of the glass pieces! Not only can they get a tad warm to the touch after use, they're also fragile; in fact, the elbow piece for the plastic hose was cracked right out of the box, though it still worked fine and didn't cause any issues during use. And get this: the Extreme Q is ideal for the lazy or the weak of lung because it has a built in three speed fan that'll force the vapour right into you! If it would only run to the kitchen and bring back a snack and a beer it might be perfect! There's also a timer you can use to shut the machine down, I assume in case you've passed out. The timer also means you can leave the Q running at temperature between "sessions," which cuts down on the heating up time. The panellists didn't mind shutting it off between sessions, though, since the vapour was worth the wait and that way they used (marginally, undoubtedly) less electricity. How green of them! The Extreme Q appears to be built very well, and the handsome metal body stays nice and cool to the touch. The whip hose mounts onto the glass elbow piece easily and once it's perched on top of the unit it can swing around 360 degrees to facilitate passing it around the table, though you have to be careful about it because it's simply perching there - there's no mechanism involved - and it can be pulled out easily if you aren't careful. It can also stick a bit, but it isn't a big deal. It helps to stir the herb inside the bowl while using it, for optimal vaping. Be careful, though, because the glass is hot and the little screen inside the elbow unit can fall out and end up down in the bowl with the herb - and if you don't get it out the stuff being vapourized can float up into the hose (and/or your lungs). The Q comes ready to go (well, they suggest you run it for 15 minutes before first use to ensure any the shipping stuff residue gets burned off before reaching your lungs) and even includes extra screens. There's also a special potpourri bowl and some potpourri for those who want to add some aromatherapy to their vaping - or just to minimize probing questions about why you have a miniature Dalek on your coffee table. Arizer recommends you use the Extreme Q on a flat surface, so the air intake (which is on the bottom) isn't blocked. Since nothing in life is perfect, the Extreme Q's size and functionality doesn't lend itself to easy portable use - but the panellists had no problem making peace with its indoor focus because it's a true powerhouse performer in that venue. You can find other Extreme Q reviews here, here, here . I mentioned earlier that, while vapourizers can offer a clean alternative to smoke, they do get dirty and if you don't keep a handle on this they can get quite gross. Cleaning is generally pretty easy, though, if you use isopropanol and some Kleenex or paper towel. Or Q-Tips, which brings me to those Iso-Snaps I mentioned above. They look like conventional Q-Tips, but they're filled with isopropyl alcohol; you snap the swab with the little blue line and the liquid runs down into the other end, leaving you a wet one and a dry one you can use to clean out the crud. You get 24 in a pack ($5.95 USD each) and they work quite well. Be careful about snapping the swab, though, because it's easy to snap it right off and render that end useless. For some insight into the vapourizer market, the issue of marijuana itself, and a look at the vapourizers the panel tried before, here's another link to that first column.